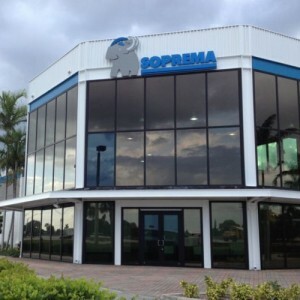 Soprema Florida Regional Office started life as a Harley-Davidson dealership in Pompano Beach, Florida. The transformation from a Retail building to an Office/Industrial building included the following: Repairing the building systems, Replacing most of the interior finishes, Painting the exterior of the building, Upgrading the landscaping and Adding new exterior signage. 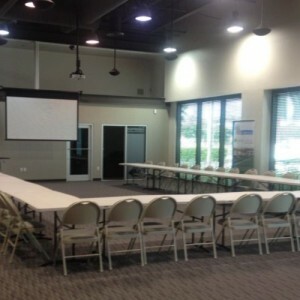 As part of the renovation, new Offices and Conference / Training spaces were created for the education of sub-contractors and professionals in the Roofing Industry. The build-ing was designed to be flexible in its use and allow Professional Or-ganizations such as BOMA, AIA, etc… to utilize the facilities for meet-ings and events. & colors. The Exterior Design Concept was to integrate Soprema’s corporate colors by complementing the existing Architecture and giving the building a new identity. Opportunities were also taken to increase the efficiency and environmental impact with the repair and replace-ment of the deteriorated building components. This was achieved through the use of LED lights at the building entry and energy efficient HVAC units for the ones that were unserviceable. Features: One–Story (+/- 18,000 Sq. Ft., renovation project. Painting the complete building interior and exterior.